The Booker Prize Foundation announced this week that the Man Booker International Prize is to evolve from 2016, to encourage more publishing and reading of fiction in translation. From next year, the prize will be awarded annually on the basis of a single book, translated into English and published in the UK, rather than every two years for a body of work. The 2015 Man Booker International Prize highlighted the growing importance of fiction in translation, with eight out of ten of the finalists having been originally published in a language other than English. For the 2016 prize, both novels and collections of short stories will be eligible. As a further acknowledgement of the importance of translation, the GBP 50,000 prize will be divided equally between the author and the translator. Each shortlisted author and translator will receive £1,000. This brings the total prize fund to GBP 62,000 per year. Furthermore, the Man Booker International Prize will in future join forces with the current Independent Foreign Fiction Prize administered by the UK newspaper, The Independent. Boyd Tonkin, senior writer on The Independent, who has been on the judging panel for, and a champion of, the Independent Foreign Fiction Prize since 2000, will chair the judges of the 2016 Man Booker International Prize. He said: “The Independent Foreign Fiction Prize has through its record of success built a unique reputation as an annual showcase for the very best in global fiction, and for the precious art of the translator. I am delighted that, through the newly configured Man Booker International Prize, even more readers will have the chance to encounter the finest fiction from around the world. It is particularly thrilling to see the translator’s role acknowledged by the equal division of the prize between writer and translator.” Tonkin’s fellow judges will be announced in due course. They will select a longlist of 12 or 13 books next March, followed by a shortlist of six in April, with the winner announced in May. 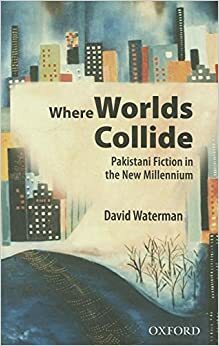 About the book: Where Worlds Collide is a survey of contemporary Pakistani writers. Pakistan's current generation of English-language novelists, born after the 1971 war and writing in the twenty-first century, must navigate between the ancient cultural history they have inherited and the relative youth of their country as a political construct. Where Worlds Collide explores the works of seven writers of this generation, including both residents of Pakistan, and also authors from the diaspora, in order to examine the manner in which questions of history, culture, and identity arise from this process. The fictional portrayals of lives represented in the works of these authors take into account everyday issues, stories of individuals and their families, their joys and sorrows and fears, and place them in the context of the greater story of Pakistan. Together, these writers explore in practical terms: What does it mean to be a Pakistani now and what might it mean in the near future? How does one speak of past trauma without disrupting the present? What is the role for Islam to play in the governance of such a diverse country? How can Pakistan ensure the future equality of its boys and girls? About the author: David Waterman teaches at the University of La Rochelle, France. Details: Published by Oxford University Press, Pakistan, in harback. Priced in local currencies. Each week I invite administrators of relevant and interesting-sounding blogs to write a paragraph about their blog. Hello! This is Don Bosco from Super Cool Books in Singapore. Super Cool Books is trying to be a few things at once: a publishing studio, an Asian young adult (YA) imprint, an iPad eBook store, and, of course, a blog - it's mostly about DIY publishing. I started Super Cool Books four years ago, to develop stories for children and teens, mostly inspired by Asian myths and pop culture. Eventually the aim is to put out Asian YA stories by other writers, but right now, published titles are mostly my own writing. As suggested by the blog, Super Cool Books is also known for promoting a DIY publishing approach, and experimenting with transmedia projects. I've spoken about all this at the Singapore Writers Festival, Asian Festival of Children's Content, and Broadcast Asia. I've also been using our blog to feature like-minded people, mostly in Singapore and Malaysia, who are creating Asian stories for young readers, or doing cool indie publishing stuff. Please get in touch if you think we can collaborate in any way. Click here. Do you run a blog you think may be of interest to readers of Asian Books Blog, and which you'd like to see featured in the blog spot? If so, get in touch, preferably via e-mail - asianbooksblog@gmail.com. Each week I make a suggestion of an interesting Twitter account you may like to follow. This week, China Rhyming, from Paul French, author of books about modern Chinese history and contemporary Chinese society. He describes @chinarhyming as a gallimaufry - a jumble, or, indeed, a rojak - of random China history and research interests. Paul French’s latest book is Midnight in Peking.